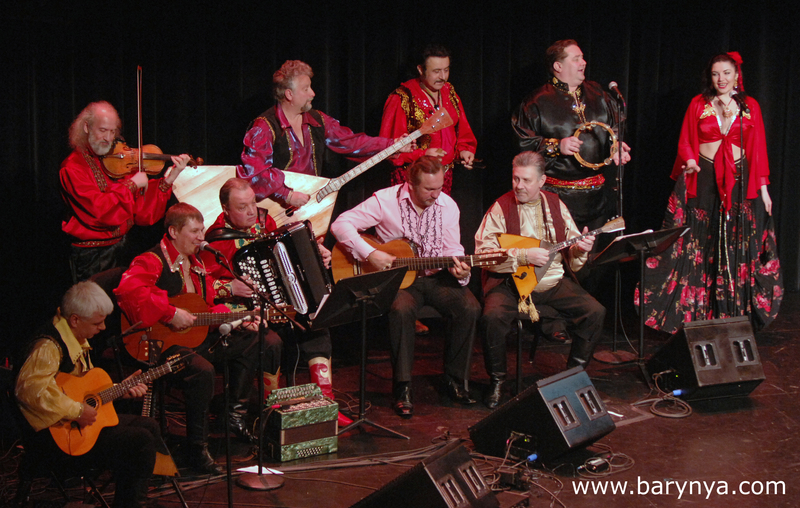 "Barynya", "Moscow Gypsy Army" - "Mazal Tov" - Mad Chad Taylor - "Hollywood Revisited"
Artists' Page 1: "Barynya", "Moscow Gypsy Army" - "Mazal Tov" - Mad Chad Taylor - "Hollywood Revisited"
The Russian music, dance and song ensemble Barynya (Russian: Áàðûíÿ), established in the year 1991 in New York City, is a world renowned group that enjoys exalting stature as the premier Russian folk ensemble outside of Russia. 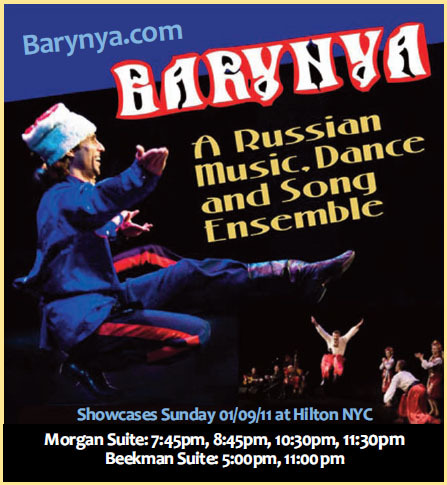 Barynya presents Russian, Cossack, Ukrainian, Jewish and Russian Gypsy traditional dancing, music, songs, and virtuoso performances on instruments including the balalaika, garmoshka (Russian folk button accordion), balalaika contrabass, bayan accordion, Gypsy guitar, violin, and the domra. Barynya has been invited to perform at some of the most prestigious cultural venues in the United States, including Carnegie Hall in New York, the National Constitution Center in Philadelphia, the Smithsonian Institute of America in Washington D.C., the United Nations in New York, and the Russian Embassy in Washington D.C.
View ensemble Barynya photo gallery Barynya is globally recognized and boasts an impressive client roster of dignitaries, politicians, celebrities and organizations from around the world. The group performed at the black-tie Gala after the Liberty Medal was presented to former Soviet leader Mikhail Gorbachev by President George H.W. Bush in 2008. The prestigious event was attended by over one thousand dignified guests including the likes of Tom Brokaw, Dikembe Mutumbo and Van Cliburn. Barynya dancers pictured on TV GUIDE website during SUPERSTARS OF DANCE international competition led by famous producers Nigel Lythgoe and Simon Fuller (American Idol, So You Think You Can Dance). Barynya performed acrobatic Cosssack dance routine in this competition hosted by Michael Flatley ("Lord of the Dance") and Susie Castillo, a former Miss USA. Artistic Director of Barynya was one of eight judges to decide which country will take home the coveted Trophy. Of course, Mikhail was not able to vote for Russian Team or Barynya dancers. The show premiered on NBC network on January 4th and aired through January 26th, 2009. Gypsy Roma (Romani) dance, music, song ensemble from New York City Moscow Gypsy Army is available for corporate events, fashion shows, sporting events, theme parties, product launches, promotional events and other private or corporate functions and events nationally and internationally. Ten musicians, eight dancers and six singers. The group offers extended program of Roma (Gypsy) songs, music and dances. Show is available for hire locally or internationally as one powerful ensemble or in smaller groups to fit into any budget. 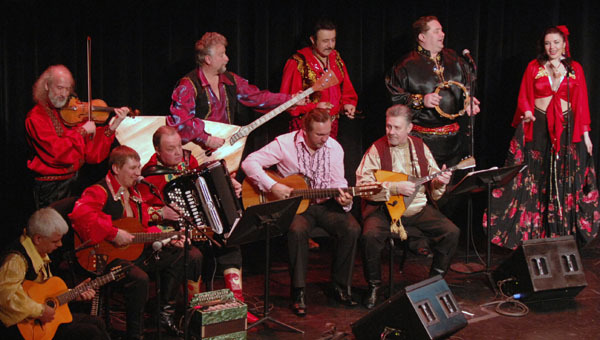 Russian Gypsy music, song and dance ensemble from New York is available for all kind of events. "Mazal Tov" is a Jewish dance and music ensemble was founded in 2009 in New York City by dancer, dance teacher, choreographer Alexander Rudoy. "Mazal Tov" is an American-Jewish dance, song and music company dedicated to celebrate the spirit of Jewish culture throughout the world of dance, song and music. Soloist - acclaimed actor-singer Yakov Yavno. Alexander Rudoy mixes traditional Jewish, Hebrew, Klezmer, Yiddish and contemporary Israeli choreography to create for his audience a special feeling about his beloved Jewish culture - ancient and modern. Unlike many other Jewish dance ensembles "Mazal Tov" ballet consists of male and female dancers (up to six couples). Alexander Rudoy was born in Ukraine, former USSR. He began his dance training at the age of six with Jewish folk dance company "ENS" from Lviv and performed in various parts of the country and throughout Europe. In 1991 he came to New York and continued his studies of ballet, jazz and modern dance. Mr. Rudoy's credits include "Joy in Every Land" with "AllNations Dance Company" (China and Argentina tours), "Winter's Tale" with "Moscow Circus" (choreographer), "Moldavanka" with Russian-American Musical Theatre, Midwest tour with Barynya and Battery Park Lechaim Festival Company. Acclaimed actor-singer Yakov Yavno is an iconic figure and one of the greatest performers to emigrate from the former Soviet Union. Yakov Yavno’s performances are always a REVELATION! He embodies the tragedy and triumph of Russia’s Jews, who have been continually persecuted, uprooted and resettled. With his powerfully resonant yet caressing bass-baritone, he creates bridges between cultures, championing the indelible spirit of his ancestors with sold-out shows in Israel, Russia, Australia, and throughout Europe, the Far East and the Americas. Familiarly known as "YaYa", Yavno was born in Minsk, Belarus, into a musical family and received his formal education at the famous Gnesin Academy of Music. Later, he became a leading actor at the acclaimed Jewish Musical Chamber Theater in Moscow. 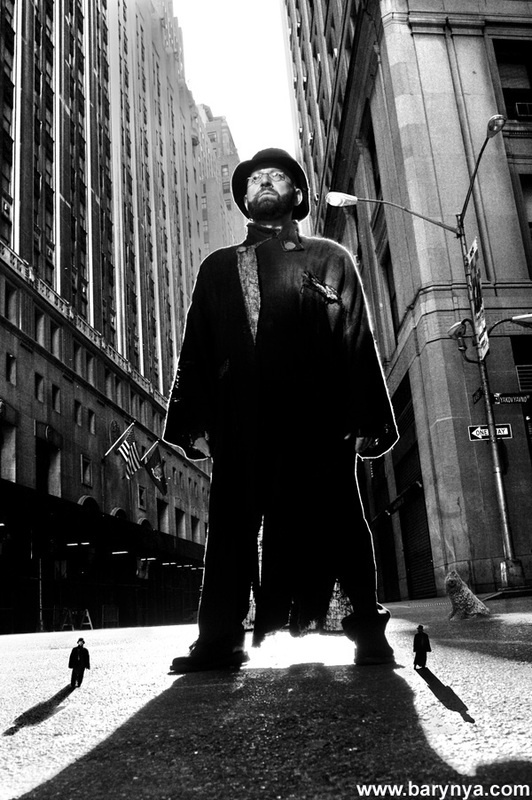 When he moved to the U.S. in 1990, Yakov began touring the world on a regular basis and singing in venues that range in size from small cabaret-style halls to sold-out stadiums. Yavno has been featured in the National Opera House of Tel Aviv and the Jerusalem Convention Centre in Israel, the Bolshoi Theater, Carnegie Hall and Lincoln Center’s Avery Fisher Hall. He has appeared in assorted theatrical works with Vanessa Redgrave, Christopher Reeve, and Raul Julia, among others. Yavno is often heard on radio and seen on TV, and has recorded three albums – Let’s get together, Shadows of Forgotten Voices, and Bridge Over Time. There’s only one thing more entertaining than a madman juggling roaring chain saws, and that’s when he drops one. Put on your safety goggles and move back four rows, because here’s Mad Chad Taylor, the Evil Knievel of Comedy. A twisted product of Dogtown, USA, Mad Chad got his start juggling at age 13 on the Venice Beach Boardwalk. Since then, Mad Chad’s ridden his skateboard of death to stardom, performing his highly participatory brand of comedy in 49 of 50 states. Get with the program, Georgia! This Guinness World Record holder has juggled everything from working video cameras to a bowling ball that he can catch with his head. Tickling and terrifying audiences from Berlin to Tokyo, He has cut it up on every imaginable variety show, from “The Tonight Show with Jay Leno” to “Last Call with Carson Daily” to “The Donny and Marie Show,” where he kept himself from falling off his unicycle by leaning on Marie Osmond’s hair. “Good thing I wasn’t juggling a baseball bat at the time,” he says. Mad Chad’s so unforgettable Sam Raimi gave him a role in “Spider-Man III.” He’s so good he taught Dustin Hoffman to juggle for “Mr. Magorium’s Wonder Emporium.” And he’s so powerful not even three 100,000 volt stun guns can stop him. Whether he’s performing his hilarious 90-minute show to sold-out crowds at performing arts centers, imploring boisterous college audiences to throw knives responsibly, or teaching Fortune 500 executives at companies like AT&T and Nissan to multitask using heavy-duty logging tools, Mad Chad Taylor may be the most dangerous man in comedy, particularly if you sit too close. Then again, those tend to be the really expensive seats. Experience what it's like to watch the stars walk the red carpet as your favorite Tinseltown classics come to life in Hollywood Revisited. This stunning musical revue showcases a dazzling line-up of costumes actually worn by the stars in the original Hollywood films. Filled with music, history, memories and fun, the revue allows the audience to genuinely feel as if they were revisiting the days that made Hollywood a dream factory. The cinematic wardrobes of Marilyn Monroe, Elizabeth Taylor, Barbra Streisand, Julie Andrews, Gene Kelly, Bette Davis, Kathryn Hepburn, Ginger Rogers, Mae West, Bob Hope and Judy Garland are just a few from the vast collection of over 300 costumes available for this flexible and modular show. Hollywood Revisited is much more than a visual treat. Acclaimed vocalists dance and sing while recreating unforgettable moments from the Golden Age of Hollywood. The show has overwhelmingly won international critical acclaim and has performed throughout the United States and Europe. Don't miss the live dynamic extravaganza that is Hollywood Revisited. "....a chance to see the magic of old Hollywood come to life!" "....We loved your music, your singers and the absolutely stunning costumes. "....I had the time of my life seeing some of the great Hollywood costumes and hearing the wonderful music of this very special show." "An extraordinary feast for the eyes and ears....a totally original look at Hollywood Glamour."